Tomorrow is the 3-month anniversary of our April Fool’s event, where we added 10 crazy new units to the ladder for a 24-hour period. Well, get ready to call in sick tomorrow, because we’re doing it again. Only better. No, this will not be a new skin. 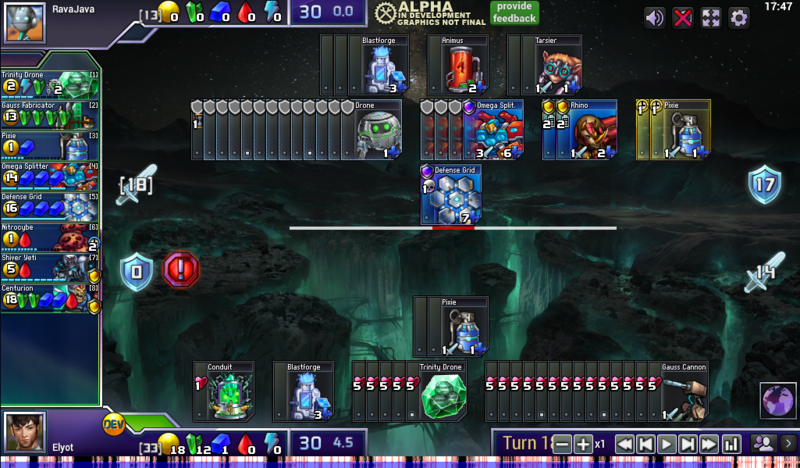 This time, we’re throwing a 24-hour BREACH PARTY on the Prismata ladder, in celebration of the release of 3 new Prismata units with one thing in common—they all help provide ways to execute the unusual Prismata strategy of not buying Walls. At midnight EDT tonight, the BREACH PARTY will begin. At midnight, the server will briefly go down for a mini-update in which BREACH PARTY MODE WILL BE ENABLED FOR 24 HOURS. The following three new units will be added: [Borehole Patroller, Tantalum Ray, Thorium Dynamo]. See below for their stats. The following 3 units will be 10 times as likely to appear in arena games: Borehole Patroller, Tantalum Ray, Thorium Dynamo. The following 10 units will be 3 times as likely to appear in arena games: Trinity Drone, Venge Cannon, Gauss Fabricator, Cluster Bolt, Iso Kronus, Wild Drone, Shredder, Ebb Turbine, Militia, Iceblade Golem. Embargoes will be applied after the above changes. For example, if Thorium Dynamo is embargoed by one player, it will show up with 3.33x its usual frequency instead of 10x its usual frequency. Custom games will not be affected. I’m truthfully super excited for this update, because these are three of the most fun units we’ve tested yet. We hope you’ll enjoy them! Borehole Patrollers are tons of fun, acting as spammable counters to Frostbites, Drakes, and other bursty threats. They also pack lots of offensive pressure. The Tantalum Ray has a ridiculous amount of HP for its cost, providing you with the option of Walling up and bleeding its HP for bonus damage, or just letting your opponent swing at it forever to bring it down. Let’s just say that the dev team spent a ridiculous amount of time analyzing different openings with this thing before deciding on its final cost and stats. Near the end of a long game in which I transitioned to a breach-proof strategy following the purchase of a Gauss Fabricator. With a huge pile of Trinity Drones and Gauss Cannons, it will be difficult for my opponent to defeat my forces, even though I’m not building any defenses. For the BREACH PARTY, we’re boosting the appearance frequency of the best breach-proof units—those high-HP attackers and economic units that can take tons of damage and don’t really need defending with Walls. Moreover, you’ll be seeing ultra-frequent appearances of the mega-bulky Thorium Dynamo and Tantalum Ray to really take breach-proof strategies over the top. If you’ve got plans tomorrow, fear not. We’ll be hosting an ENCORE BREACH PARTY again this Saturday from noon EDT until midnight, so you’ll have a second chance to get in on the action. Also, we’ll be giving out a ton of free “It’s a breach party!” emotes in Prismata’s global chat, both tomorrow and Saturday. As well, I’ll be giving one to anyone I meet on the ladder! See you at the BREACH PARTY!